I’ll admit it, enchiladas are one of my favorite things to eat. So simple, so tasty, but typically not very healthy. That’s a problem for me cause I like to eat A LOT. So, I created these delicious Vegan Green Enchiladas with Mexican Quinoa that satisfies both my obsession with enchiladas AND my desire to eat healthy. 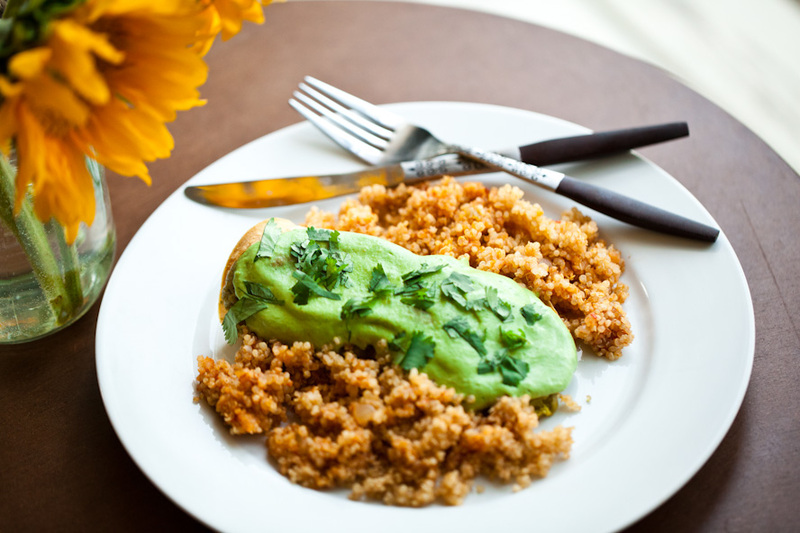 The Mexican Quinoa that’s served with these Vegan Green Enchiladas is SUPER easy to make. I planned to make the simple Mexican Rice recipe from our Mole Enchiladas, but when I went to prepare it I realized we were out of rice. Thus, this delicious quinoa recipe was born. All you have to do is throw everything in a rice cooker! How simple is that? Speaking of simple, the sauce for the Vegan Green Enchiladas is even easier than the Mexican Quinoa! Pour all the ingredients into a high powered blender and 2 minutes later you’ve got culinary heaven. Creamy, flavorful Vegan Green Enchiladas that are so easy to make! Filled with hearty spiced tofu, vegan mozzarella, and mashed potatoes. Served with Mexican rice for the perfect dinner! Preheat the oven to 375. Combine all ingredients for the Mexican quinoa (or rice if you prefer) in a rice cooker. If it's a small rice cooker, place a towel underneath it in case it bubbles over at any point. Set the rice cooker and move on. In a small sauce pan, bring water to a rolling boil (enough to cover the chopped potatoes). Add the potatoes and cook until they are tender, about 5-7 minutes. Remove from heat, drain the water, and place the potatoes in a medium sized bowl. Mash them with a potato masher or fork and stir in the remaining ingredients. Set aside. While the potatoes boil, melt the oil on medium high heat. Add the onions, cook for 1-2 minutes until translucent. Stir in the chopped garlic and sauté for another minute. Add the green pepper, cumin, chili powder, and 1 tsp sea salt. Stir to combine. Crumble in the tofu, then add 1½ cans of green chilis and mix well. Cook for 5-7 minutes, stirring often. In a high powered blender, combine the green salsa, soaked cashews, nutritional yeast, tapioca flour, and cilantro. Blend on high for 2-3 minutes until the sauce is smooth and creamy. This recipe makes a lot, so you'll have extra! Grease two glass cooking pans with a small amount of oil on the bottom and sides. Spread 2 tbs of green enchilada sauce on the bottom of the pan. In the center of a tortilla, spoon a dollop of mashed potatoes in the center. Top it with ½ a slice of vegan cheese, and a large scoop of the tofu filling. Carefully roll up the tortilla and place it seam side down on the pan. Sometimes the tortilla will split. To avoid this, warm your tortillas before filling them. Repeat the filling process with the remaining tortillas and spread ⅔ of the sauce on top with a spatula. Bake at 375 for 30 minutes. Top with the rest of the sauce and serve with Mexican rice or quinoa. What if I don’t have a rice cooker? Could I do this same thing for the quinoa on the stove top?! This will be dinner next week.Yes i’m lazy, cook once ‘Sunday’ eat all week. I LOVE how clean and quick loading your page is.